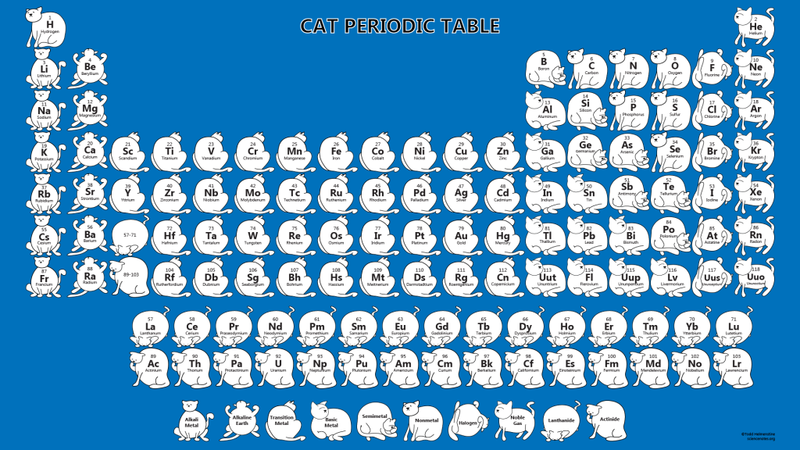 This cat periodic table wallpaper is a little unusual but a lot of fun. Each element group is represented by fat cats in different poses. Periodic Table with fat cats for element groups. Contains each element’s atomic number, symbol and name. This wallpaper has dimensions 1920×1080 pixels, making it suitable for widescreen HD displays. Each cat contains the element’s atomic number, element symbol and element name. This wallpaper is available in PDF format for printing. For regular printing, choose landscape orientation and ‘fit’ for the printing options. The writing is rather small, but readable. The ‘poster’ option in the print dialog made an excellent poster on my printer. I had to use scissors and tape, but the end result was nice. Give it a try! There is also a plain white version of this table for those trying to save color toner or ink.